Early Booking of 10% discount for advance of 90 days prior to the date of your reservation. Early Booking of 5% in advance of 30 days prior to the date of your reservation. 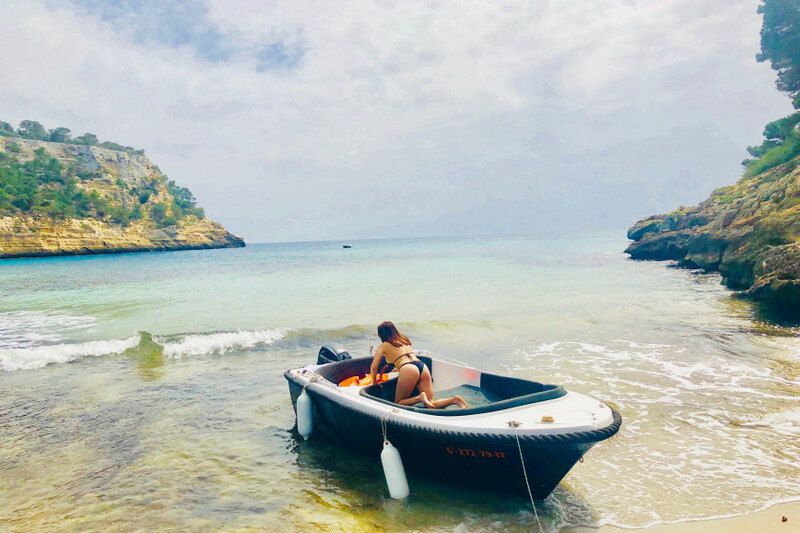 We reward those who anticipate, do not miss the opportunity by booking in advance and be able to ensure a unique experience in Menorca. 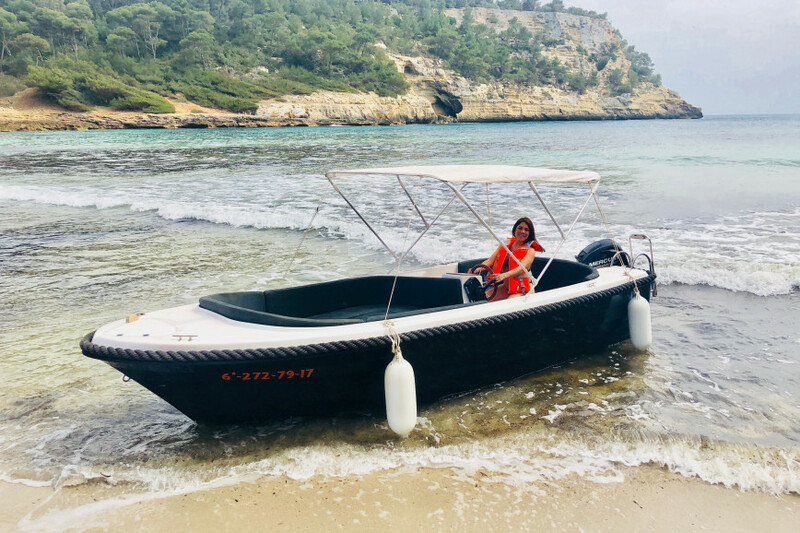 The rent per full day is 8 hours and half day 4 hours, engine 15 hp NEW, you will never have problems, do not make more queues to see your favorite coves. 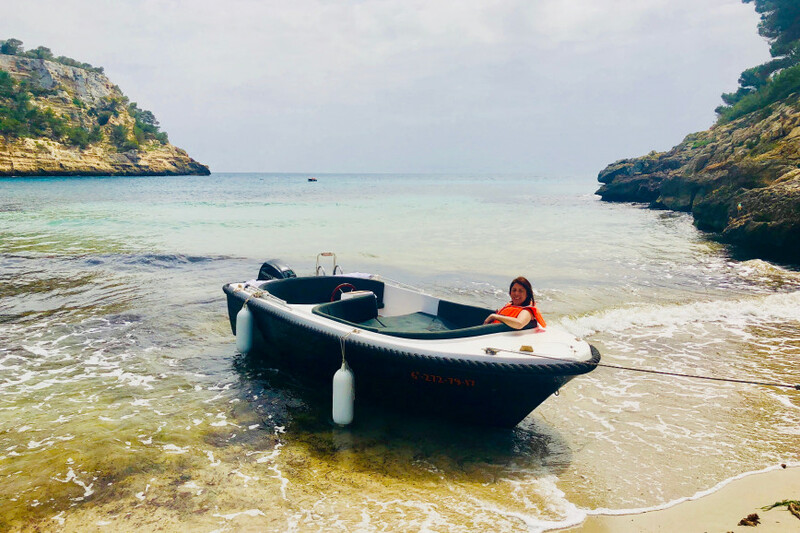 I have departures with this boat from the ramp of the Santo Tomás Beach, to visit only the most beautiful coves of the South of Menorca. 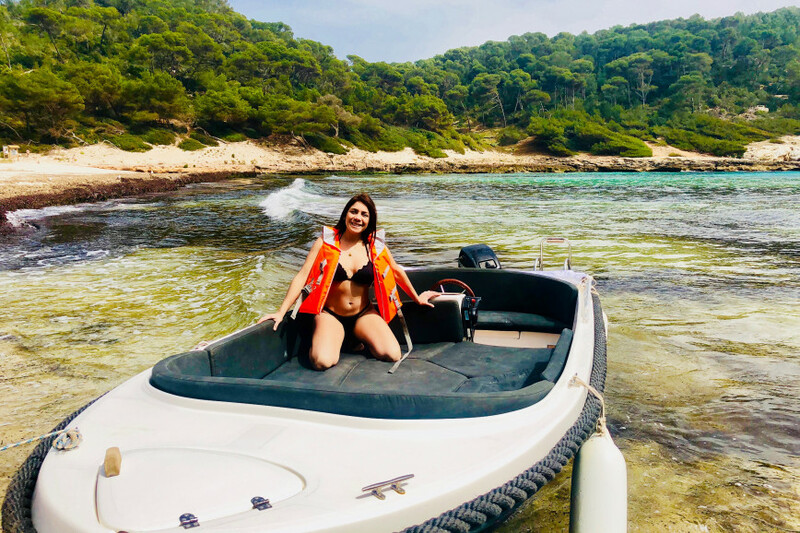 - Calan Porter, Turqueta Cove, Macarella Cove, Mitgana Cove, Cala Galdana, Binigaus Beach, Santo Tomás Beach, Son Bou Beach, Calescoves, Binibequer Beach, Son Saura Beach, Es Talaier Cove, Trebaluger Cove, Fustam Cove , Cala Escorxada, etc. IMPORTANT !! : It will depend on the time hired to access some beaches and coves. It will also depend on the wind and waves that may be in some areas (Check availability of visit on day of the reservation to indicate the best route). In the same way I will indicate which routes are the most appropriate and the most visited by my clients. It is essential to wear lifejackets at all times during navigation. 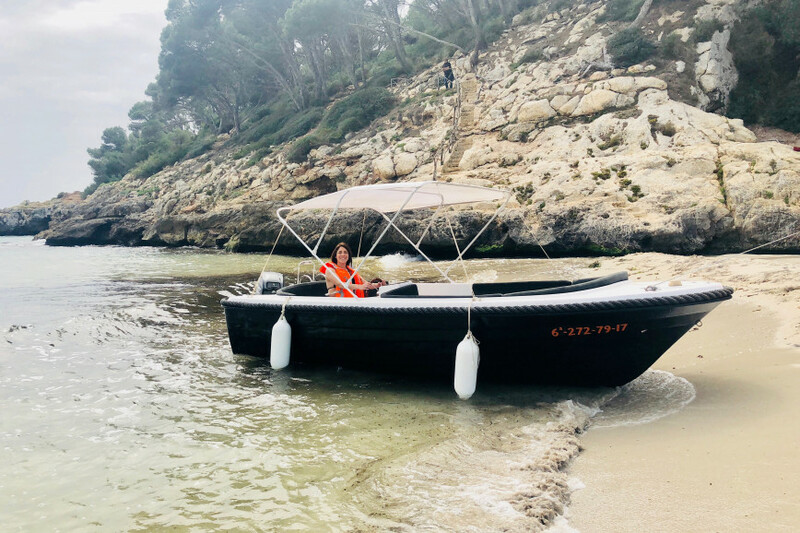 All our boats are easy to use and DO NOT REQUIRE TITLE, NOR EXPERIENCE, anyway the day you wish to sail will indicate all the instructions necessary for the operation of the boat. 99% of our customers are satisfied and have never sailed in their life. I can also offer you another base port with another different boat, the same without titling like this one. 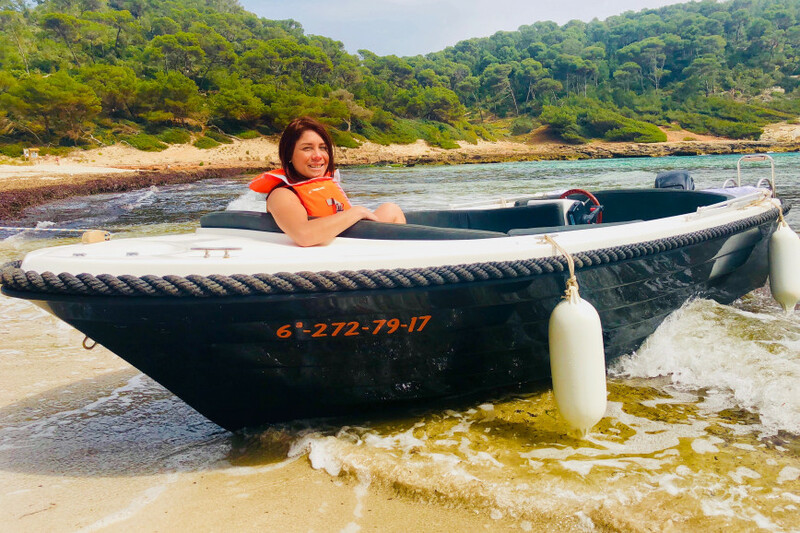 Consult me ​​for availability from Santo Tomás or Puerto de Fornells with another of my boats. The boat also has a plastic fridge (without ice) to carry your food or drinks in better conservation. All rentals are without gasoline, for a half day it is 20 euros and for a whole day it is 40 euros. It has anchor in the front of the boat, bimini awning reinforced stainless steel to cover well of the sun, mattresses in the solarium to go as comfortable as possible and a central space to store backpacks and other things. We do not have a waterproof bag, and we have life jackets for all of you and for children as well. - Paddle Surf: To be able to get closer to the shore in a fun way. (€ 20 1/2 day and € 30 full day). 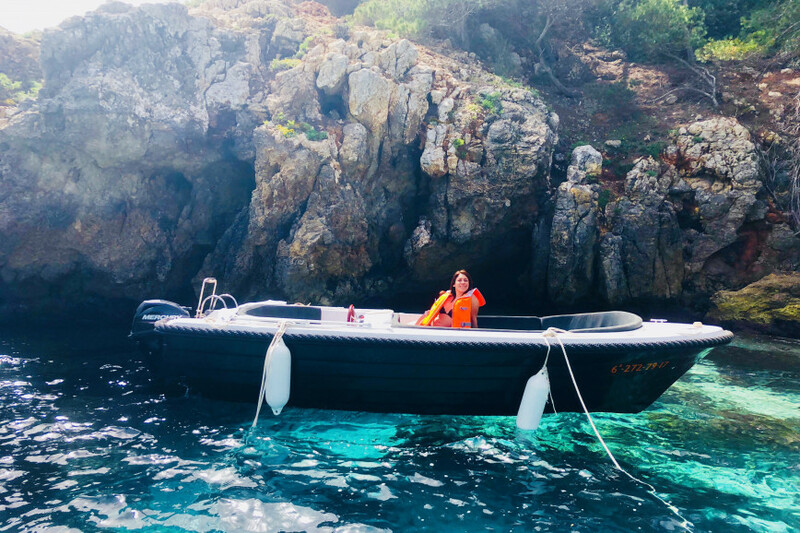 - Skipper: Accompany in all your navigation to assist you with the anchoring, approach to lower drafts to reach the coves, take the helm whenever you do not want to have it, show you the most sought routes by our customers and help them at all times in boarding and disembarkation. (€ 50 1/2 day and € 100 full day). I hope you have clarified some doubts or frequently asked questions, and if you do not hesitate to ask me all the questions you need, I will answer them as soon as possible so that you can decide for us. Half day in the afternoon: Check in is at 2:00 p.m. to leave the port at 2:30 p.m. - 6:30 p.m. IMPORTANT TO KNOW !! : Hours may vary, be informed at least 2 days before your reservation. The indicative Departure Timetables, will depend on several circumstances outside of our forecast, to avoid delays, please follow the indications that will be sent by WhatsApp or Email, also the base port of this vessel can change according to the logistics of the day, I will inform you approaching the date of your reservation. Must bring bail is 150 euros in CASH !!!! 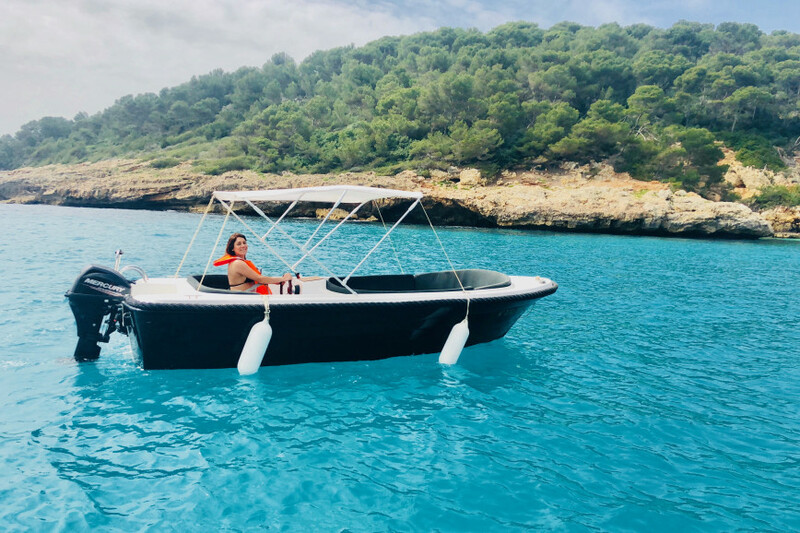 for a faster return if the boat is complete with all its accessories and in the same state that was delivered for the CheckOut, from there will also be deducted gasoline contracted according to schedule. Loss or damage to any object of the boat such as: Anchor, Mattresses, Awning, Fridge, etc. They will be discounted from the deposit. If they exceed the bond, this will remain as part of payment of damages or losses. And they must pay for the contracted gasoline plus the full amount of damages or losses. 50 euros for each half hour of delay in check Out. IMPORTANT !!! : Main Base Port: Santo Tomás. If, for any reason, the weather conditions prevent you from navigating the SUR, you would change the date for the next one so that you can enjoy the coves of the SUR or change the base port to NORTH (Puerto Addaia) so that can enjoy the coves of the NORTH (- Arenal d'en Castell, Arenal de Son Saura, Albufera d'es Grau, Binimel-la beach, Brut, Faro de Favaritx, Illa d'en Colom, Bahia de Fornells., Cabo of Cavalleria, Tortuga, Presili, Port Addaia, Macaret, Ses Salines, Tiran (Beaches of Fornells), Pregonda, Tosqueta, Savinar de Mongofre, des Pons, S'Arenaret, Pudent). Only the amount will be refunded if for the day of the reservation in case of bad weather in both port bases (North and South). This boat is license free. Flexible check-in! 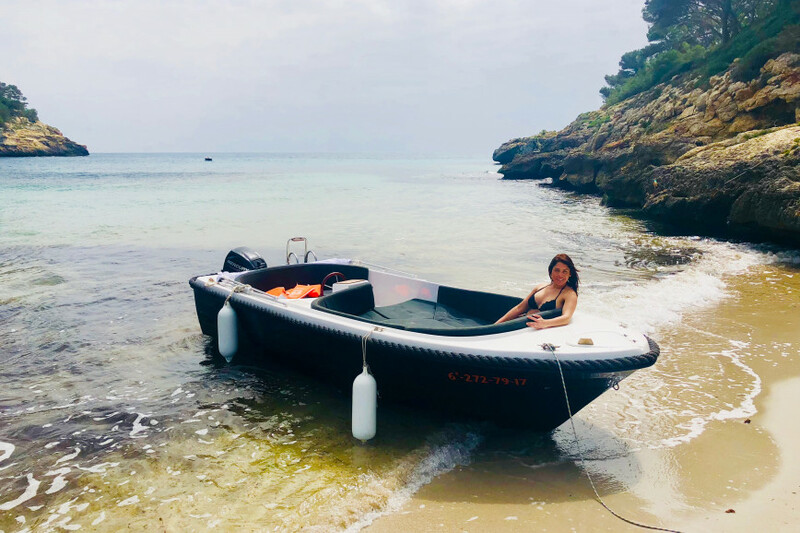 Choose the day to start your charter, the check-in starts at 9:00 h.
All our boats are easy to use and DO NOT REQUIRE TITLE, NOR EXPERIENCE, anyway the day you wish to sail will indicate all the instructions necessary for the operation of the boat. 99% of our customers are satisfied and have never sailed in their life. I can also offer you another base port with another different boat, the same without titling like this one. 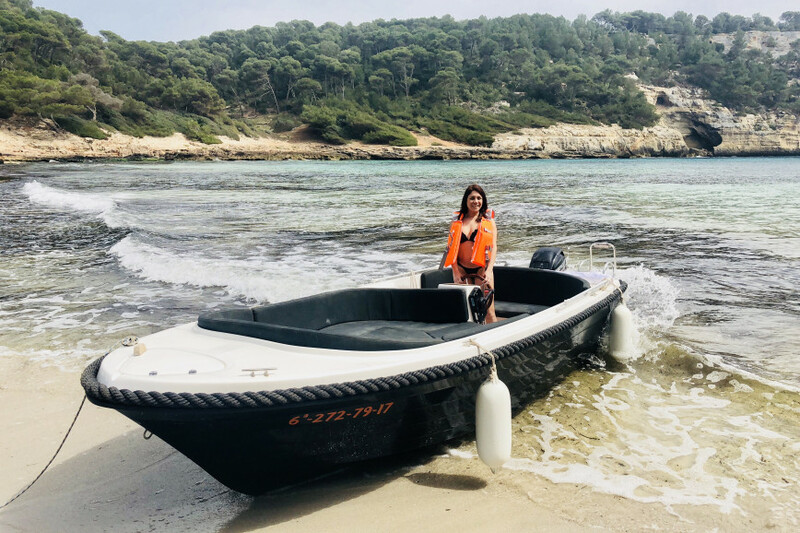 Consult me for availability from Santo Tomás or Puerto de Fornells with another of my boats. Paddle Surf: To be able to get closer to the shore in a fun way. (€ 20 1/2 day and € 30 full day). 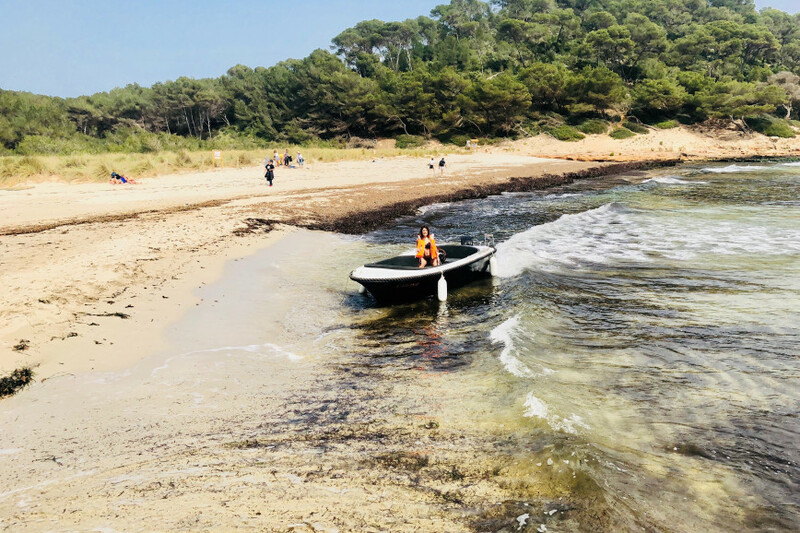 Skipper: Accompany in all your navigation to assist you with the anchoring, approach to lower drafts to reach the coves, take the helm whenever you do not want to have it, show you the most sought routes by our customers and help them at all times in boarding and disembarkation. (€ 50 1/2 day and € 100 full day). By clicking on "send" you accept our Terms and conditions.